WASHINGTON ─ Searching for a world figure who more accurately embodies the spirit, ethos and intellectual excellence of America to counterpoint the recent address to congress by Israeli Prime Minister Benjamin Netanyahu, Democratic leaders invited Britain’s Prince Charles to speak to Congress today. The House Chamber was packed with three Senators, seven Congressmen and 525 staffers and teenage pages sent to fill the rest of the seats. The glow from hundreds of cell phone screens gave the room a spectral appearance. The Prince of Wales, who is also the Duke of Rothsay and the Duke of Cornwall, depending on who you talk to in the British Isles, spoke through an interpreter to translate British into American. Members of the Press hired interpreters to interpret the British interpreter, who sounded as though he’d applied his Fixodent to the wrong side of his teeth. 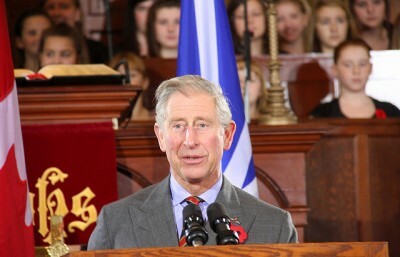 Charles, who many political analysts often describe as looking like “a geometry problem with hair,” opened his address to Congress with what most reporters believe was a joke about an American maid trying to make tea in a steam iron, which drew smiles and nods from the handful of people in the room who speak British. He also lauded “…those sitting in this stately chamber who built this august house on the edge of a wilderness,” prompting most of the audience to look around at the others. Assembled lawmakers and staff minions gave the British Heir Apparent a sitting ovation.